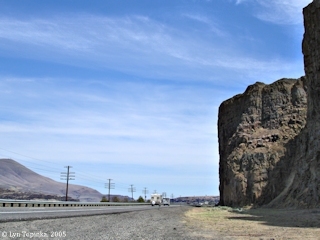 "Basalt Flow - 'Cape Horn near Celilo'"
Throughout history there have been five different features named "Cape Horn" located along the Columbia River, one of them being this basalt cliff upstream of The Dalles and downstream of Celilo Falls. 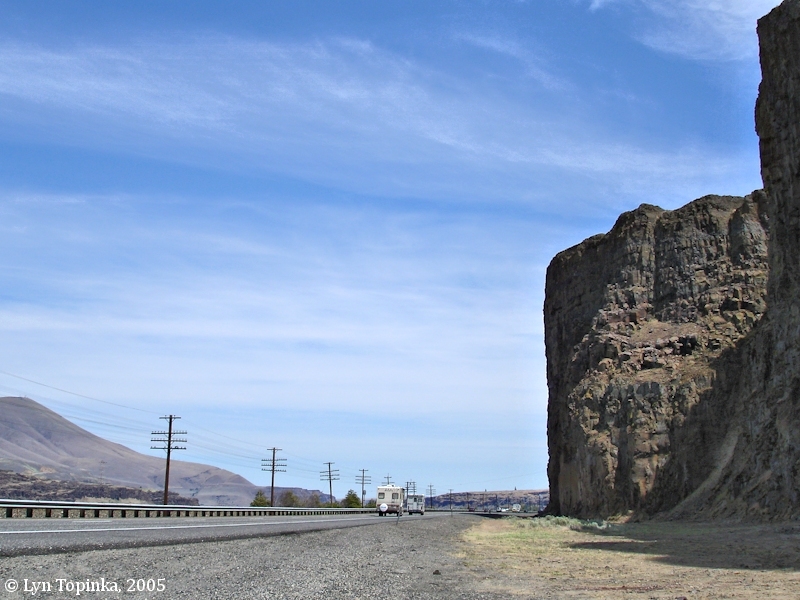 One of the Cape Horns along the Columbia River is located upstream of The Dalles, Oregon and is located at Columbia River Mile (RM) _____. In 1873 Mrs. Frances Fuller Victor in her publication "All Over Oregon and Washington" wrote about Cape Horn near Celilo ... (p.96). 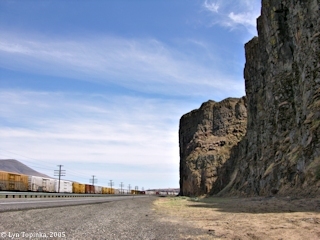 "Cape Horn near Celilo" was located along the Celilo Canal. Another early name for this "Cape Horn near Celilo" was "Applegate Point". This basalt cliff is not named on topographic maps. Click image to enlarge Basalt Flow between The Dalles and Celilo, Oregon. Image taken June 4, 2005. Two famous views of "Cape Horn near Celilo" exist, taken by photographer Carleton Watkins in the late 1860s. One is "Cape Horn, near Celilo, Columbia River" (Stereograph #1329) and the other is "Cape Horn near Celilo" (year 1867). This last image hangs in many museums around the world. In 2000, a print of Watkin's "Cape Horn near Celilo" went at auction for $236,750 to a San Francisco dealer. "... Watkins settled in San Francisco at the height of the Gold Rush, taking up the still-new medium of photography in the mid 1850s. In his pictures he aspired to capture the vastness and grandeur of the American West for audiences primarily on the East Coast and in Europe. In pursuing this goal Watkins composed images that were astonishingly sophisticated and modern in appearance. Watkins made photographs that are visually immediate, lush in detail, compositionally abstract and psychologically compelling. ..."
Carleton Watkins' 1867 image "Cape Horn Near Celilo" shows the massive basalt flow of Columbia River Basalt on the right with the Oregon Portage Railroad at its base. 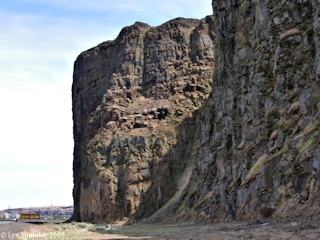 Haystack Butte, Washington, is in the left background. See "The Golden Age of Postcards" below. Click image to enlarge Carleton Watkins, Cape Horn near Celilo, Oregon. Webpage of "masters-of-photography.com". Image taken June 5, 2005. Click image to enlarge Cape Horn near Celilo, Oregon. 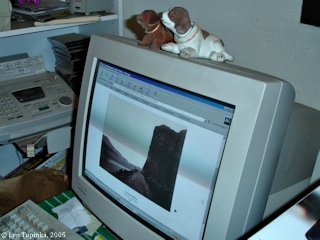 Image taken June 4, 2005. Click image to enlarge Penny Postcard: Cape Horn near Celilo, by Carleton Watkins, 1867. New "Penny Postcard", "Cape Horn Near Celilo, Columbia River, 1867.". Image created in 1867 by Carleton Watkins, Postcard from 1983. Oregon Historical Society Columbia River Gorge Postcard Series II (Watkins Series). Carleton E. Watkins No.456. Published by Western Imprints, the Press of the Oregon Historical Society. In the private collection of Lyn Topinka. Click image to enlarge Penny Postcard: Cape Horn near Celilo, Oregon, ca.1946. Penny Postcard, Postmarked 1946, "Cape Horn, Oregon Trail Highway, Oregon". This is not today's Cape Horn, but is the "Cape Horn near Celilo", made famous by Carleton Watkins in 1867. Sawyer Scenic Photos Card #C13121. In the private collection of Lyn Topinka.